The Royal National Association serves a truly national purpose in presenting to us each year, within the compass of less than 30 acres, a striking record of the progress of the State. Each year's Show is a glowing tribute to the industry and enterprise of our people, reflecting also the energy and enthusiasm of its organisers. 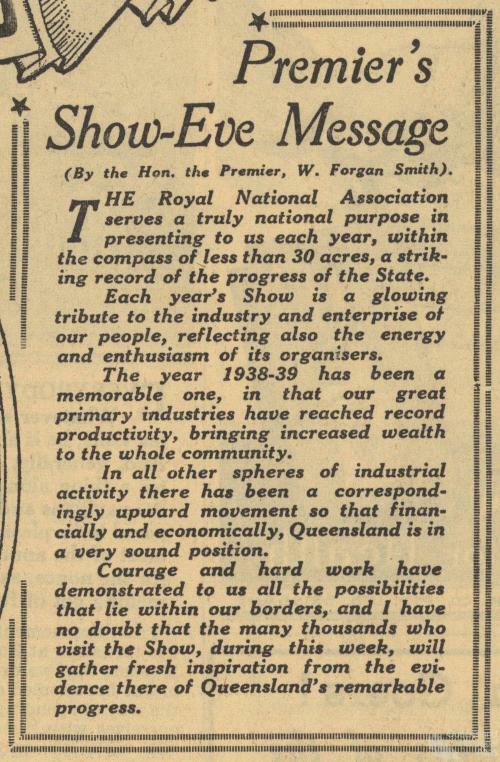 The year 1938-39 has been a memorable one, in that our great primary industries have reached record productivity, bringing increased wealth to the whole community. In all other spheres of industrial activity there has been a corresponding upward movement so that financially and economically, Queensland is in very sound position. Courage and hard work have demonstrated to us all the possibilities that lie within our borders, and I have no doubt that the many thousands who visit the Show, during this week, will gather fresh inspiration from the evidence there of Queensland's remarkable progress.